"The fellowship of true friends who can hear you out, share your joys, help carry your burdens, and correctly counsel you is priceless. 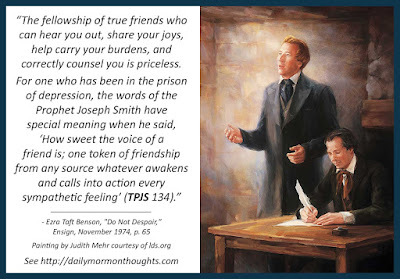 For one who has been in the prison of depression, the words of the Prophet Joseph Smith have special meaning when he said, 'How sweet the voice of a friend is; one token of friendship from any source whatever awakens and calls into action every sympathetic feeling' (TPJS 134). "Ideally, your family ought to be your closest friends. Most important, we should seek to become the friend of our Father in heaven and our brother Jesus the Christ. What a boon to be in the company of those who edify you. To have friends, one should be friendly. Friendship should begin at home and then be extended to encompass the home teacher, quorum leader, bishop, and other Church teachers and leaders. To meet often with the Saints and enjoy their companionship can buoy up the heart." Joseph Smith knew the difference between a true friend and a pretend friend, a partial friend, an occasional friend. He saw many leave or turn against him when challenges came. 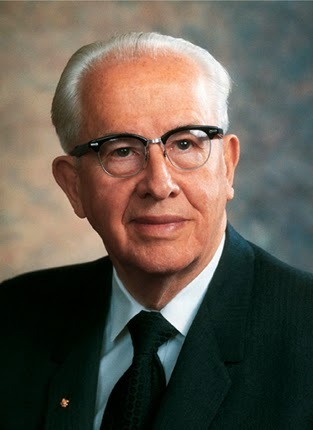 I liked President Benson's insights into the sources of our closest friends: Deity, family, church associates. Friendship in those settings is strengthened as we "meet often with the Saints and enjoy their companionship" as well as by our own attitudes at friendliness.